Farmers markets and Community Supported Agriculture (CSA) operations are great places for customers interested in locally sourced products to find and purchase organic products. Many of these consumers appreciate knowing how and where the products that they purchase were grown, and the organic cer ca on status of the farmers. 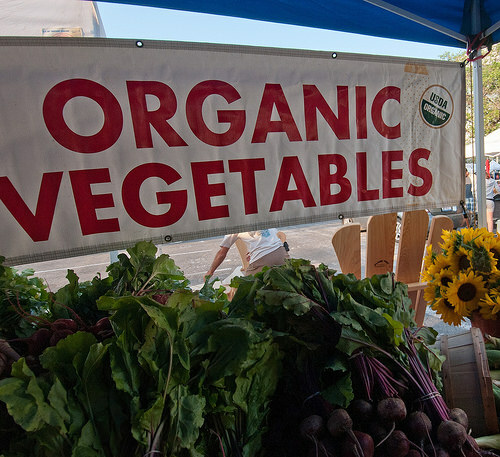 Farmers and vendors who use the word “organic” to describe their products or prac ces in the marketplace must comply with the USDA organic regulations. The Organic Foods Production Act (OFPA) states that no person may affix a label to, or provide other marketing information concerning, an agricultural product if that label or information implies, directly or indirectly, that such product is produced and handled using organic methods, except in accordance with the OFPA. This inspection report form is utilized to verify that vendors at the Ann Arbor Farmers Market are the sole producers of their products. Cities and towns around the United States host an increasingly common ritual: large crowds of local food enthusiasts in search of the fruits of regional agriculture. These consumers are not simply seeking out the freshest produce; they also flock to farmers’ markets in search of the many values attached to food that is sold by the people who grew it. Locavores prefer small farms to massive, distant agribusiness for freshness, environmental, social, and safety-based reasons, and they assume, when so assured by the market, that the food at the market is in fact local. And these consumers have not been, for the most part, deceived; the large majority of sellers who claim to sell local produce are very likely honest. But there are strong incentives for fraud: local produce can bring premiums at farmers’ markets, and the costs of packaging, labeling, and middlemen are greatly reduced. These incentives are sometimes too tempting to resist. Some sellers that claim to sell freshly-picked carrots have picked these carrots from a grocery store pallet, not from a field.Misrepresentations about the source of produce harms consumers who are cheated, and it damages the many honest farmers who lose their customer base. This Essay explores this troubling phenomenon and explores possible solutions. After examining existing and potential approaches to curb fraud, including market agreements and grower contracts, regulation, and criminal enforcement, it suggests a hybrid system. Where consumers can distinguish between locally-grown and mass-produced products and there is competition among markets, markets should — and likely will — adopt and enforce rules for monitoring and enforcing food source claims. But where it is difficult for consumers to identify product sources or competition is weak, more regulation is needed: states should adopt clearer standards for defining and enforcing producer sales, and markets, which have local knowledge and staff already on the ground, should enforce them. Earning a reputation as the most transparent and trustworthy place to buy local farm goods directly from farmers requires appropriate policies and fairly enforced verification protocols. Learn about the Agricultural Institute of Marin’s (AIM) Farm Audit Program, which has verified more than 240 California farms and ranches since 2010 in order to uphold their vision of Producer-to-Consumer Direct. Tyler Thayer, AIM’s Farm Audit Program Manager will walk us step by step through their detailed audit system, in which all participating farms and ranches are audited both at market and on the farm. Presenter: Tyler Thayer has been working in the farmers market industry for 24 years, managing different farmers markets across California. Since 2000, Tyler has been working for Agricultural Institute of Marin (AIM), an FMC member organization and 501(c)(3) non-profit that connects communities and farmers, operating seven certified farmers markets in the San Francisco bay area. Tyler was instrumental in developing and implementing AIM’s Farm Audit program, an innovative and robust program verifying that all farmers participating in AIM farmers markets truly grow what they sell, ensuring that AIM’s markets are fair, honest, and of the highest quality possible. Additionally, Tyler manages the Newark farmers market and AIM’s educational outreach program that serves thousands of children and adults each year. This one page assessment form can be used by producers when evaluating and comparing different farmers markets as outlets for their products. A sample form used by the Farmers’ Market Federation of New York to evaluate their vendors on market day in terms of topics such as image, display, product, pricing, and customer service. A form created by the Portland Farmers Market for vendors their concerns about market operations, vendor policies, or other vendors’ compliance with market rules. Requires vendors to specifically reference the market policy clause with which they have a concern. A form created by the Portland Farmers Market for vendors to submit when they believe another Vendor is misrepresenting their product. There is a $100 filing fee (which can be shared by a group of Vendors). This fee is returned to the challenger(s) if the claim is verified. A summary of a booth audit program to confirm that vendors are reporting accurate sales figures at the end of each market day.